Despite the low price, the Pocophone has a Gorilla Glass screen. So, it won't scratch from normal use. The edge has a graphite coating that makes it feel like metal, but it's actually plastic underneath. The back is also plastic without the layer. That means something like keys (or a box cutter) could damage it. 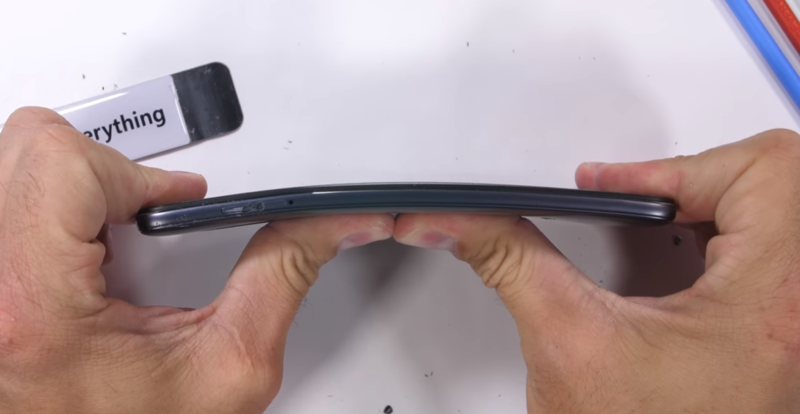 The bend test is what everyone comes to see, and the Pocophone fares well. The device flexes to a somewhat worrying degree, but it comes through unscathed. Even some bending in the opposite direction doesn't cause any permanent damage. So it's cheap, plasticky, but durable. Not bad.